We will see how to read the XML nodes,its sub nodes and the data. Let’s start with a practical example. We will take the below XML as input. How to Load the XML file? We need to create the object for XML parsing. 'argXMLFilePath - Path of the xml file argXMLFilePath = "D:\Demo.xml Set oXMLFile = CreateObject("Msxml2.DOMDocument") oXMLFile.Load(argXMLFilePath) oXMLFile.async = "False"
1. We are creating the object for XML using “Msxml2.DOMDocument”. 2. We are loading it through load method. 3. Async has some specific significance here. If async is true, then method returns the control to the caller before the download is complete. If async is flase, then download must be completed before the caller gets the control back. How to count the particular nodes? One of my friends asked for a help on one of his requirement and the requirement was like fetching all nodes, child of that nodes and their data into one excel file. Functions given below are generic. If you have same kind of requirement,then you just need to provide the required file paths and few arguments, Rest it will take care. Otherwise, you can have some idea from this to fulfil your specific requirement. I am sharing that code, so it will helpful for needed.I will tell you in the end,How to call these functions. You can use the same XML and the functions to see how it works. You will require 3 functions as given below. 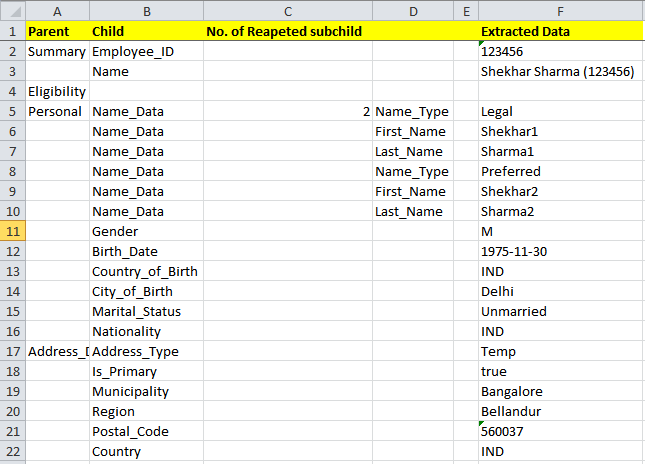 'argExcelPath :Excel workboox path like "D:\Demo.xls"
'argSheetName : Sheet name where to store the nodes like "Sheet1"
msgbox "Your reporting function if expected parent not found"
You can call these functions as shown below.